The National Auto Body Concil’s (NABC) Recycled Rides program donated four refurbished rides to four needy Dallas residents on April 4. The donation was also supported by car donors Allstate, GEICO, Farmers and State Farm; and collision repair partners Service King Euless, Caliber Collision Frisco, Berkshire Hathaway Toyota of Richardson and Berkshire Hathaway Vandergriff Chevrolet. The presentation was held at the NABC Lone Star Pars for Cars Golf Fundraiser at the Texas Star Golf Course in Euless, Texas. Retired MSGT James Marquis, who served more than 25 years, primarily with the 136th Air National Guard Security Forces, received a 2018 Hyundai Elantra that was donated by GEICO and repaired by Caliber Collision Frisco. Marquis was nominated by the Air Power Foundation for his service to his country and can now pursue his desire to return to college and provide support services for other veterans in need. Josephina Garcia, wife and mother of two, was presented with a 2014 Kia Optima that was donated by Allstate and repaired by Service King Euless. She was nominated by the Trinity River Mission due to her need for transportation to work and school. Jasmine Jones, a mother of three who faced financial difficulties after a severe car accident, was nominated by Family Promise of Irving for her commitment to work through her challenges and return to a stable life. She will receive a 2011 Toyota Camry that was donated by Farmers Insurance and repaired by Berkshire Hathaway Toyota of Richardson. 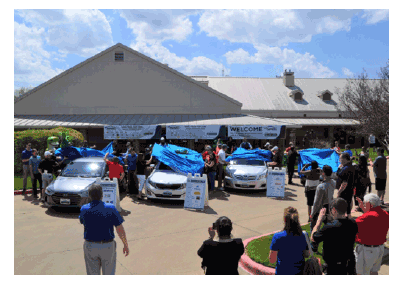 Krystal Calhoun, a mother of two young children, will receive a 2014 Hyundai Elantra that was donated by State Farm and repaired by Berkshire Hathaway Vandergriff Collision South. She was nominated by Family Promise of Irving, which is helping her and her family get back on their feet financially with an independent lifestyle. Additional supporting partners included 3M, AC Towing, asTech, Auto Creation, Bodyguard, Cowboys Towing, English Color, Freeman Mazda-Hyundai, Gold Team Interiors, Hudson’s Auto Glass, Keystone/LKQ, J B Dent Magic of Arlington, North Texas Detailing, North Texas Tire, PPG, 800 Charity Cars, Vandergriff Chevy and Vandergriff Hyundai. NABC Recycled Rides is a program in which businesses representing all facets of the collision repair industry team up to repair and donate vehicles to individuals and families in need of reliable transportation. Since the inception of the Recycled Rides program in 2007, NABC members have donated more than 2,000 vehicles valued at more than $36 million.